These two scenes are remarkably similar. I think it's the lack of kerbing that gives it place much the same feel as it did a hundred years earlier. 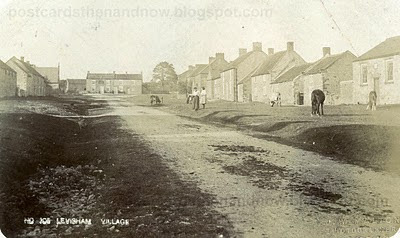 Horses and cows replaced by cars and a tarmaced road.I know this road and the Horseshoe Inn from 20 years ago. I love that google map. Great fun to find an old building still in it's place. It's amazing how similar it still is. It would be rather nice to have animals grazing on the grass. How neat is this! And to see all of the same buildings all still standing, the green lawns lighting it up in the modern photo. I love photo comparisons like this! And to find places still standing. Levisham and nearby Lockton are on my "Places to Visit". It is where my family originated from in the 16th. and 17th. centuries. As for as the Pub is concerned my Sister and her husband were there a couple of weeks ago and can vouch for it. It really hasn't changed much. I wonder if they still allow horses and cows on the lawns. Cows and horses replaced by telephone poles! Somehow I think I prefer the livestock - as long as there were still electricity. One of these days I will have to make peace with the poles. I had never heard of the North York Moors, looks like a lot of (beautiful) heath! Very interesting always to see the then and now photos. Charming in both cases. I'd be very interested to know why no trees, shrubs or flowers were planted in front of the houses. Ah this reminds me of my post about the North York Moors Railway.I remember Pickering well. Wow, amazing....not much has changed...except what may be on the bottom portion of the photo?! Probably no horses grazing! Nice To See That The Line & The Original Landscape Have Been Respected Over The Years. The sepia photo card would fun to colorize to get the green. A very military designed village. Nice to see the red phone box still survives.